Focus on whole foods, especially fruits and vegetables. Beans are an excellent source of ber. 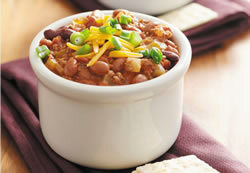 Try several kinds in a hearty chili. Fiber is an increasingly valued part of our daily diet. Fiber helps fight constipation, obesity, and disease, and it curbs hunger. But is it realistic to fit enough into a daily diet to make a difference? "It's not as complicated as you think. It just takes a little planning," says registered dietitian Kathy McManus, director of the Department of Nutrition at Harvard-affiliated Brigham and Women's Hospital.